Wow, I feel like I wrote my first “Food Philosophy” post (on fad diets) yesterday, not two months ago — time really does fly! In that post, I mentioned beans as an innocent victim of low-carb diets. Beans (as in legumes, dried or canned) are a fabulous food: high in fiber, good source of vegetarian protein, and easy to store and transport. Despite being vilified by some diets because of their high carbohydrate levels, they are a low Glycemic Index (GI) food, another factor in their favor, since low-GI diets are associated with reduced risk of a number of chronic diseases (including heart disease and type 2 diabetes). In short, a food’s GI is a measure of how a particular food impacts blood sugar levels when consumed (you can read more about GI here). The variety of beans is almost endless, and they can be prepared in many ways. I try to incorporate a serving of beans (1/2 cup cooked beans) into at least one meal a day, which is relatively easy, with a bit of planning. 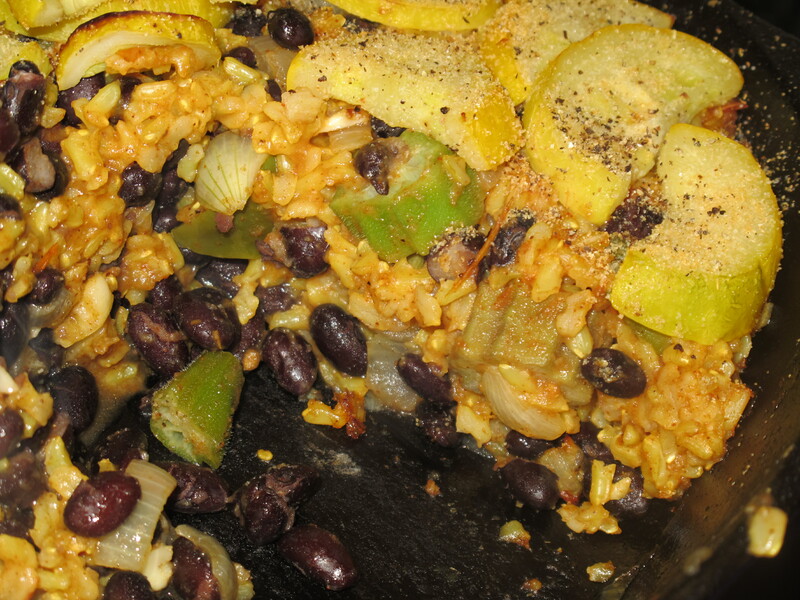 In grad school, I ate some variation on beans and rice for lunch almost every day. I prepared a big batch at the beginning of the week, and had a cheap, nutritious, portable lunch easily at hand. These days, the recipes are often a bit more complicated, but I enjoy going back to that staple, as in this oven-baked twist. Something about sitting in a hot oven for 45-minutes really elevated the flavor, making it almost creamy and cheesy (though no cream or cheese were involved). Canned beans are convenient, but because of the BPA in can linings, I almost exclusively buy dry beans. I can also buy dry beans in bulk, reusing my own bags, with little to no packaging waste. You can read my full list of advantages of dry over canned in this post. I rarely use the brining method for preparing dried beans mentioned in that post anymore. First, it requires a quick soak, which uses more energy than an overnight soak. Second, it wastes salt. Sure, salt it cheap, but I realized I could get nearly the same effect (nicely salted beans) by doing a regular soak (either quick or overnight), cooking and draining and beans, and then adding salt directly to the hot, cooked beans and letting it soak in a bit before using the beans. Quick tip: prepare twice as many dried beans as you need for a recipe/meal. Freeze the extra cooked, cooled beans in a quart-sized freezer bag, and they’re ready when you need them, almost as fast as opening a can of beans! Until recently, if asked, I probably would have said that chickpeas (AKA garbanzo beans) were my favorite legume. They still rank high, but over the last year, two other legumes stole my heart: lentils and cowpeas. Lentils (or dal, in Indian cooking) rank high for their versatility. I love blending well-cooked lentils into a variety of soups to make a hearty base. They are also fabulous in chili (recipe post languishing in draft form). Lentils also star in Snobby Joe’s, a vegetarian take on Sloppy Joe’s. Unlike other legumes, many types of lentils don’t need to be soaked before cooking, so they’re great in a pinch, when you realize you forgot to soak beans for dinner. Cowpeas come in an amazing number of forms. If you’ve eaten black-eyed peas before, then you’ve had one type of cowpea. Matthew grew one variety last summer (and Gabriel helped shell them). Our harvest was enough for just a few meals, but they were delicious. For the past few years, we’ve been fortunate to have a local source for some of our beans. Paul at Bellews Creek Farm grows two types of [dried] beans every year, usually black beans and something else. This year, the “something else” was a type of cowpea: a pink-eyed cowpea. Both varieties of cowpea — what we grew in our garden, and the pink-eyed peas from Bellews Creek — rank among the most flavorful beans I’ve ever had. While I’ve incorporated them into a number of dishes, I also enjoy then straight-up, with just a bit of salt. If you’re in StL, look for Bellews Creek beans in the bulk bins at Local Harvest Grocery. Seriously, try some! I hope to have that lentil chili recipe ready soon, but in the meantime, check out the other bean-y recipes on my recipe page. This entry was posted in Food and tagged eat local, food philosophy, healthy vegetarian, nutrition. Bookmark the permalink. Thanks fir the bean reference! We have a bean a week policy as the minimum at our house where I cook 2 lbs in a large crockpot. I don’t soak, but do rinse first (saves energy and money. Except for black garbanzoes that we can’t stop eating, I freeze in 3- cup portions for future use in our deep freeze. I season and salt all beans and love the cooking liquid as a soup stock or in bread to improve texture, making sure to omit salt. Black-eyed peas are not my favorite. Do you think I would like other cowpeas? What are black garbanzos and where do you get them? Sounds interesting. 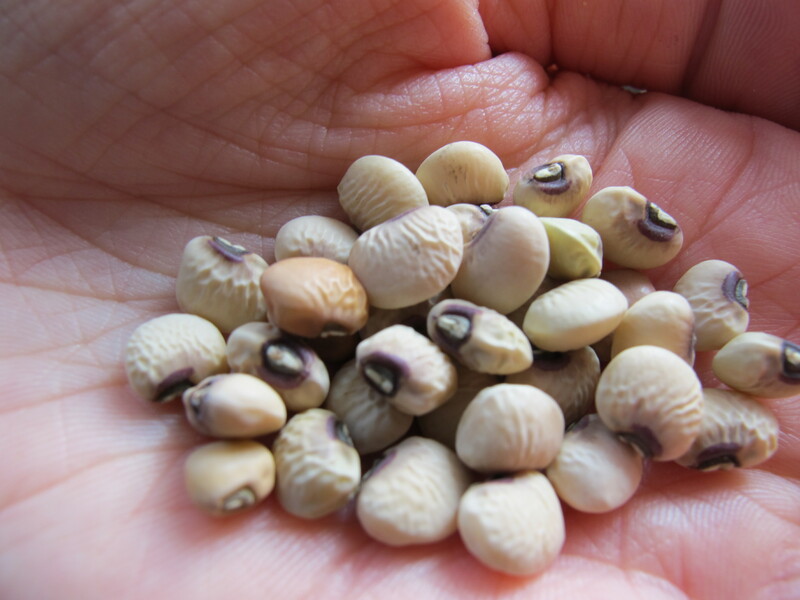 I would give the pink-eyed cowpeas a try, even if you’re not crazy about black-eyed peas. The variety I’ve been cooking are very flavorful!